Calgary is known for having one of the largest pathway systems in North America as well as one of the largest urban parks in Canada. It’s also known for having a huge number of parks, with the inner city area being of no exception. While suburban communities in Calgary have more green space than your typical inner city neighbourhood, there’s still lots of parks in the city centre for you to enjoy. Calgary’s inner city parks are for the most part centered around the Bow and Elbow Rivers. Pathways that run through these green spaces extend outwards into the the surrounding communities and make a walkable lifestyle possible for residents. 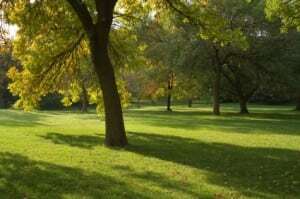 Many of the best inner city parks in Calgary we’ve listed below are near the rivers. Here’s our top 10 parks in the city centre you’ll enjoy for leisure and recreation, especially during the warmer months of the year. NOTE: All park hours are from 5am to 11pm unless otherwise specified by the City of Calgary Parks. Stanley Park is a popular inner city park with lots to offer visitors, including outdoor BBQ areas, a baseball diamond, public swimming pool, wading pool, open green areas and Elbow River access. It’s an excellent place to go if you want to outdoor BBQ, play games on an open field, launch your boat onto the Elbow River or perhaps sit poolside and enjoy the warmth of the sun. You could even park your car at the Repsol Sport Centre and run to Stanley Park or vice versa for a work out along the connecting paved pathways. It’s also home to the Confederation Park Golf Course, a 9-hole course with driving range and putting green. Confederation Park is also host to a beautiful wetland that covers about 8 hectares. This park is especially good for long bike rides, dog walks and other exercise. Its vast, open green spaces also make for a great place to play outdoor sports during the spring and summer, while in the winter there’s tobogganing opportunities on several slopes. Shouldice Park is situated in Calgary’s northwest quadrant beside the Bow River and community of Montgomery. Shouldice Park is home to multiple sport facilities including a public swimming pool, baseball / football fields, hockey rink and batting cage. The Paddle Station is another great feature of Shouldice Park. It’s your one-stop-shop for everything you need rafting and is found on the west side of the inner city park. You’ll also find a dedicated raft take-off point that makes getting onto the river as easy as it gets. A good place to get off the river when starting at Shouldice is Prince’s Island Park. The lagoon is a calm part of the river that makes docking a breeze. The redeveloped St. Patrick’s Island opened in the summer of 2015 after undergoing major restoration and redevelopment necessary after the floods in June of 2013. St. Patrick’s Island is truly a gorgeous downtown / inner city park in Calgary. With the Calgary Zoo to the east, it’s the perfect place for a summer picnic with friends and family. It’s also become a festival hub with many food truck events and others of the sort happening throughout the spring and summer months. Keep an eye open for them! Edworthy Park is unique in the sense that it spans both sides of the Bow River, making it accessible from the northwest or southwest part of the city. Only 10 minutes from downtown Calgary, this park has amazing trails and extensive patches of forest that make each run an exciting adventure. Edworthy Park is another good spot to access the Bow River with rafts, canoes and other equipment of the sort. Rotary Park is a beautiful inner city park in Calgary located in the northeast inner city community of Crescent Heights. Featuring an off-leash area, open green space, children’s playground and water spray park, it’s used by many families during the warmer months for some fun in the sun. Also featured at this inner city park are picnic table,s seasonal washrooms and water fountains. Tennis courts and land bowling are also around but are independently operated. Eau Claire Plaza is a beautiful downtown park situated on the south embankment of the Bow River with Calgary’s acclaimed RiverWalk pathway running through it. This downtown park is teeming with life in the spring and summer and connects to the very popular Prince’s Island Park. During warmer months you’ll find ice cream and food stands, street buskers and live music in the plaza itself, while just south there’s all the restaurants, shops and services of Eau Claire Market. There’s even a wading pool that’s great for young children to enjoy. Parents, just don’t let them see the nearby ice cream stand! This one-two combo makes Eau Claire Plaza one of the best downtown / inner city parks in Calgary despite actually having little green space itself. Prince’s Island Park is a man-made island located on the north end of Eau Claire. Known for its sprawling green spaces and seasonal festivals, Prince’s Island Park may just be one of the most popular downtown / inner city parks in Calgary. River Cafe is also located on Prince’s Island Park. This upscale restaurant features Canadian-style menu items that make use of locally-sourced ingredients wherever possible, some of which is grown in their very own garden! Prince’s Island Park also features a large amphitheatre (used for festivals), green spaces, children’s playgrounds, paved pathways, wetland areas, flower gardens, seasonal water fountains and bathrooms, outdoor skating (winter) picnic areas. Tom Campbell’s Hill Natural Area is a stunning park with spectacular views of downtown and other parts of the city. Located in the northeast inner city community of Bridgeland, it overlooks Memorial Drive and the Bow River, while the Rocky Mountains can be seen on the horizon off in the distance. Tom Campbell’s Hill features off-leash areas for your pets as well as paved / non-paved hiking and biking trails. Many locals come to this park to watch the New Years’ fireworks at the Calgary Zoo without having to pay to go in! Weaselhead Flats is easily reached via the Elbow River pathways from the inner city that span around the Glenmore Reservoir. This park is known for its wide diversity of plant and wildlife, a main attraction for many park goers.